Navagraha film posters had caught the attention of many, where in the film publicity team had showed 7 vintage villains of Kannada cinema - Thoogudeepa Shreenivas, Tiger Prabhakar, Sundara Krishna Aras, Sudheer, Lokesh, Dinesh and Keerthiraj. Sons of these actors along with two female leads - Varsha and Sharmila Mandre are the 'Navagrahas'(9 planets) in the movie. Well, I must admit that this film as a whole has certainly proven a point and the dawn of new genre of Kannada films evident here. Plot: Jaggu(Darshan), a robber strikes a deal of stealing the golden howdah of Mysore palace for 20 million dollars. He along with 8 others hatches a plan for the robbery. Though initially other guys refuse to be a part, later they fall in line as they are in need of money. Jaggu gets his men into action - to get information about the palace and escape routes, for making a duplicate howdah to replace the original and for making their way out after theft. The gang succeeds in getting the howdah and they are on their way to Mangalore port. But on their way, disbeliefs among themselves lead to a bloody fight, ending up killing all but two. On the other hand, special officer Bhagath is on his way to capture this gang of robbers and he succeeds in his mission too! The whole story unfolds in the backdrop of Dasara festival in Mysore. Finer details of the story are best seen and enjoyed in the movie hall itself! What to watch out for : Darshan as the chief of the gang sizzles in the entire film. This role can be easily said as the best he had played so far. Finally, he comes out of the shadow of 'longu machchu' roles. Well, we as audience can now expect such challenging roles from the 'Challenging Star'. As for the songs, 'Yami Yami' song rocks and so is 'Kan Kanna Salige' with its slow romantic tune. Even the background score for the movie is good. Dull moments are few in the movie and audience is in for a gripping thriller. Top view of the ghat section route with lush greenery(Sampage Ghat - Madikeri-Mangalore route, I suppose) is a treat to watch in the climax. These types of thrillers can be easily made a mess or magic without logic, without giving attention to finer details. Here, finer details like Dasara festival celebrations, right electronic gadgets to use, transporting howdah in KSRTC bus with right name boards, reason why Jaggu asks 6 duplicate howdahs to be made, how the police find out the place where the robbers were initially hiding etc are taken care. In this aspect, director Dinakar Thoogudeepa should be given a pat on the back for his excellent work. Also, he has improved a lot from his fogettable earlier film 'Jothe Jotheyali' with regard to script and screen play. There is no dragging of the plot anywhere and it is two and half hours of pure entertainment. This genre of films are also kind of rarity in Kannada cinema. May this film set a new trend. Kudos to the makers of this movie. Filmy Blunder : Golden howdah, as they say in the film weighs 750 kgs. Lifting this much weight is not an easy task for the gang. Also, full gang was not in action to lift the howdah. May be director could have given little attention to this and be more innovative here. What could have been done better: Use of graphics has become a fashion for the film makers. Though for some scenes this is unavoidable, one could have done away with some trivial graphics sequences. Also, editing could have been done better. All said and done, it is a movie worth watching. So, rush to your nearest theatre to catch the earliest show! 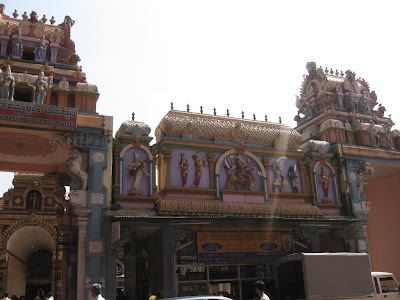 25 kms from Mangalore, Kateel Shri Durga Parameshwari Temple is one of the most revered places for Hindus. 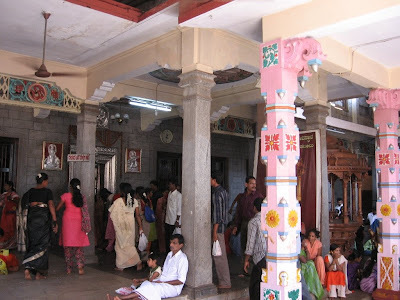 This temple draws lot of devotees daily and is on the list of every tourist who is on a pilgrimage tour to Dakshina Kannada. Kateel temple, abode of Goddess Shri Durga Parameshwari is located in the middle of Nandini river. The place surrounded by river and greenary all around, thus making it a picturesque location. 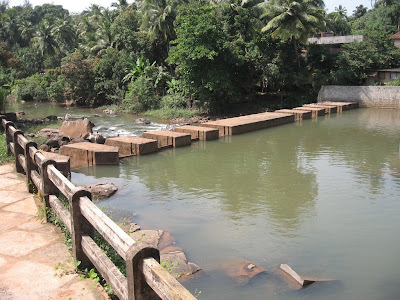 To enter into the temple, you have to cross a small bridge. Sound made by the flowing river in the temple premises is enchanting to hear. Just being in the calm temple surroundings , gives you a nice experience. As per the Kshethra Purana, this place was once faced severe draught. At that time, Maharshi Jaabaali made a request to Nandini, daughter of Kamadhenu to come to Bhoo Loka (earth) to help him in performing yajna to get rid of the draught. When she dishonoured his request, he cursed her to flow in the earth as a river. When Nandini pleaded for mercy, Maharshi asked her to pray to Adi Shakthi to relieve her from the curse. Adi Shakthi after hearing to Nandini told her that she would take birth as her daughter to relieve her from the curse. Meanwhile, Arunasura, one of the rakshasas, had got a boon from Brahma that he will not be killed by Thrimurthis(Brahma,Vishnu,Eeshwara), devas, men, women or by any two leggged or four legged animal. He started troubling the sages and spoiled their yajnas. At last, Adi shakthi in the form of a big, furious bee called 'Bhramara' stung him to death. Devi, then emerged in the form of a 'Linga' in the middle of the river Nandini. From then on, this place is known as Kateel ('kati' in Kannada means waist and 'ila' means earth/place). Other gods worshipped in the temple are Raktheshwari, Mahaganapathi, Shaastaara, Kshethrapaala, Naaga, Brahmaru, Chaamundi. Annadaana or free meals to the devotees is served daily in the afternoon and night. 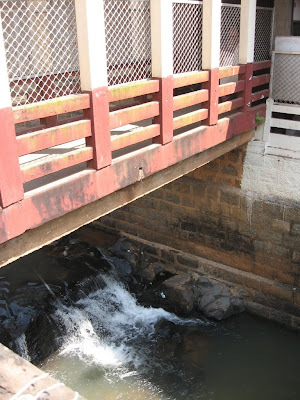 To go to the Bhojana Shaale(or Dining hall), which can accomodate upto thousand people at a time, one has to cross another bridge from the temple. 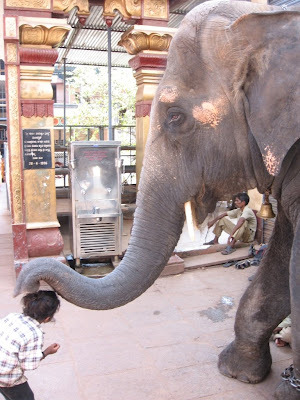 Temple elephant, is an attraction among the devotees who come here from far away places. 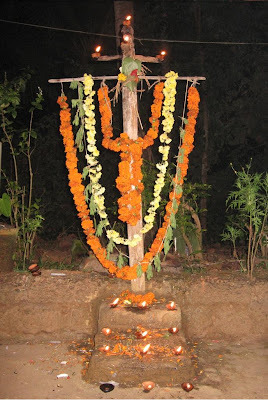 Yakshagaana, a popular folk art in coastal Karnataka, is performed by the temple troupes. 4 such troupes are already booked for the next 10 years to perform at various places. These troupes travel mostly in Dakshina Kannada, Udupi and Kasaragod districts for performance. Kateel is a must visit place for all those visiting coastal Karnataka. Green surroundings is for the pious and also for the nature lovers! I am sure you will definitely wish to visit the place for second time if you had come here once. 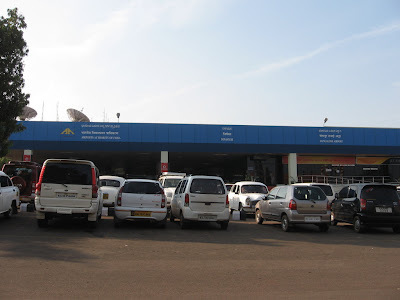 Visited Mangalore International Airport at Bajpe recently. Here are some snaps of the place. When I entered the viewers gallery, plane to Dubai was yet to take off and Jet Airways and Kingfisher planes to Mumbai were lined up next. 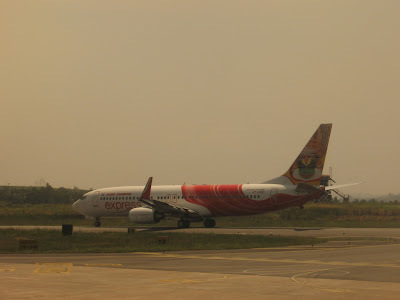 Entry ticket is valid for 3 hours and it entitles the holder to enter Departure Lounge, Arrival Lounge and Visitors View Gallery, from where one can watch the arrival and takeoff. 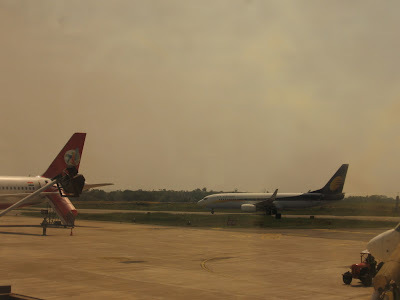 New Mangalore International Airport at Kenjar ready by Jan 2009? Disappointed! After all those hype about not revealing the lead characters of the movie and some great music by Raghu Dixit, this film turns out to be a no-show. Well, audio of the film had captured enough audience for the movie before its release but now I see this movie will be remembered only for that and nothing else. Well, hero and heroine of the movie are Dhanush and Anita. First 10 minutes of the movie does not have any dialogues. It seems like a new tactic of the movie maker. But soon the audience in the cinema hall is made to watch the lonely house of the psycho most of the time with his antics. Visits by his uncle along with a servant who does black magic in the house premises makes audience believe that there is something fishy. But all those speculations are shot down at the end. Plot : Hero of the movie is a psychopath, who is in love with Pavana, a TV anchor. Dhanush helps Pavana in various ways. Pavana refuses to befriend him as he calls her repeatedly without revealing his identity. Then, all of a sudden she starts to love him! Pavana, once in conversation with Dhanush records his voice and gives it to her friend. Her friend, whose father is a doctor curing Dhanush reveals all the details about the psycho path. An anxious Pavana goes to Dhanush's house and rejects her love. Doctor then explains how a traumatic childhood had turned Dhanush into a psycho and how he was becoming normal after in love with Pavana. Pavana is sad to know now that because of her rejection, he is back to being a psycho and goes back to reunite with her love. But she only sees him dying and she starts living in psycho's house, rest of her life. Dhanush needs more acting classes for his role. Anita lacks that heroine look. Most of the characters in the movie are new faces except for Padmaja Rao(of Mungaaru Male) as heroine's mother. So not much to say about acting. Most of the songs picturized seems ordinary compared to music and lyrics, which had become a huge hit. I also felt sometimes songs were out of place in the narration. 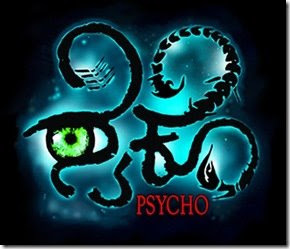 Melodious 'Namma Naadu Karunaadu' song found in Psycho album, does not feature in the film. Brilliant camera work is the only highlight of the movie apart from music. But that too seems like an overkill as similar camera shots are shown repeatedly. Till the last 15 minutes of the movie you dont know what is going on and you expect some twist in the tale. But that does not happen and all of a sudden all the flash back is thrusted upon the audience and the film is over in another 5 minutes. Entire movie is about 2 hours, so audience would have escaped another 30 or 60 minutes of torture compared to a regular movie. My recommendation to film goers is a strict no to this film. Still some questions remain unanswered : what is the purpose of the movie, if it does not cater either the class or the mass? OR are the movies based on psychopaths are made this way only?